JUDY Murray has revealed her Wimbeldon winning son Andy used to go by the name of Mini Moo. The tennis mum who coached both Andy and his older brother Jamie son to award winning level said the whole family were known on the circuit as The Moos with older brother Jamie being called Maxi Moo. Judy, who until recently was known on Twitter under the name of Jud Moo explained: "When we went to tournaments overseas we were always called The Moorays. It became The Moos for short. There was Mini Moo - Andy, Maxi Moo - Jamie and Jud Moo - myself. A lot of kids and coaches used to call us by those names. That is how my Twitter name came about but I have changed it now to Judy Murray so more people know who I am." 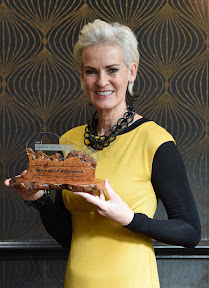 Judy who recently won the top gong at Action For Children's Scotland's Woman Of Influence Awards admitted she was shocked to be given the trophy. I think it was 1999 I last won something from the LTA - coach of the year. It was a really strong pool of candidates and of course you're standing up in a whole room full of women and it meant a lot to me that I was voted by them. Action For Children is also a great charity and I really like what they do." Judy is determined to provide more tennis facilities and coaching throughout the UK and beyond for young people before Andy and his brother retire. She said they may only have a few years left to play. She explained: "I get tired sometimes but I'm really on a bit of a mission because I understand Jamie and Andy won't play forever. They may only play for another couple of years and then we won't have that leverage and excitement so you have to do something now. They've been playing on tour since 2005. It's their twelfth year already and it's a long time. Nothing goes on forever. You've got to prepare for some kind of legacy. The worst thing for me is that they retire and look back and nothing has changed."